2017 for me was the year of loss, love and lessons. I also experienced a bit of personal growth from my experiences. I started out the year like a BOSS, attending a fun, fruitful conference where I joyfully networked, received some new opportunities and reunited with old friends. The upcoming months were filled with great coaching clients to work with, travel, new friends who I love, some exciting art licensing opportunities and a class reunion. Then the second half of the year started to slow down and came to a screeching HALT! My 83 year old mother passed away! It was devastating. She had been slowing down but we weren't prepared for how quick her decline was. She was surrounded by friends and family as we hospiced her at home in New England. I felt honored to be there by her side in her last days with my loving and supportive family. My friend perfectly describes losing your mom as the "earthquake of your life". It is disorienting, confusing and painful. My dad had passed away a few years prior and having no parents was something I just never could've imagined - let alone at 43. It hit me - I wasn't alone. I realized that many people are having babies in their 40's now. My mom had me at 40 in the 70's when it was completely unheard of. Now it's the norm. I learned first-hand that life is short, precious and that we must cherish our loved ones and every moment we have with them creating sweet memories. UGH. I was away from home in the middle of my trip and there wasn't much I could do. I had potential business and some announcements coming out and knew people would be looking at my site in the next week or two. The site was riddled with malware. The home page had Asian language in which the Google translator said I was selling wheelchairs and electronics. UGH. I decided to toss up my hands and enjoy my vacation. Being present and enjoying the time with my family was more important and geez with all I had been through this wasn't the end of the world. I normally would've been a Defcon 5 situation but I weighed out the good and bad and decided that I would not let this ruin my vacation. I clearly grew from my experiences and realized it will get fixed. So here we are with a new site and a new blog. I considered the website hacking a blessing. I never would've made a new site in a week's time. My old blog content needs to be cleaned of malware and it can be restored. That's next for me to tackle. I now have a new, fresh start in this new year. Being present, going with the flow and learning the lessons is the new normal for me. My mom is with me always and I am sure she's proud of my growth. I'm so excited to announce my recent interview in one of my favorite publications, Flow Magazine! If you aren't familiar with Flow this magazine it is a fantastic resource for creative types that promotes the importance of having a creative, healthy mindset, fostering and developing your creativity through the inner world, support for the ebbs and flows in life, finding flow in your life and living creatively. It is beautifully designed and illustrated and always has fun goodies to tear out and use (like notebooks, posters and bookmarks). They even offer additional publications and products such as a 2018 diary, their adorable gift book "A Book that Takes it Time" and other special editions. I am so pleased with the feature and honored to be a part of this special magazine. It provides tremendous emotional and creative support and is very timely and needed right now. ***You can read my interview here. Please check out this thoughtful magazine. You can find it in Barnes and Noble stores or purchase it on Flow's website. I am extremely excited to announce my wedding suite designs, Forever Flowers, with Mixbook. I was inspired by the tropical trend and thought my invite design would be great for destination weddings or anyone who loves vibrant flowers. I've personally love their customizable product line of home decor and photo products. In my Forever Flowers suite you can choose from the invitation, save the date, reception cards, enclosure stickers, address labels, and a thank you card. Grab the invite here! Valentine's Day is near and I'd love to share the this fun collaboration I did with the fabulous and creative, Amber, of Damask Love. Each month she is showcasing a different artist who created an exclusive printable for her newsletter subscribers. This month I am the artist! I created this watercolor Valentine's floral for you to personalize and give to your loved ones. See Amber's instructional post on how to assemble the card and envelope liner. Amber is a whiz at crafts and styling and I love her aesthetic and big personality. Her blog is a must read for any craft lover. Subscribe to her newsletter on her site (in the side bar) to get my Valentine printable all the other upcoming monthly printables and studio news. You're going to love her and her work! I had the pleasure of working on a super-fun project for the CA Lottery. I created illustrations for the lottery that depicted Los Angeles, Sacramento and San Francisco/Oakland landmarks. I was approached as they were interested in working with a California artist to create illustrations that celebrate these cities and showcase major landmarks and those that have significance in the African American communities. The campaign just launched in the last couple of weeks and I couldn't wait to share it. The illustrations were placed in local papers in LA districts and animated, digital banners were placed on sites such as Bet.com and Hip Hop Wired. Woo-hoo! I am heading to Alt Summit at the end of the month. This will be my 4th time attending this conference for creative bloggers and I am even more excited to be speaking this time. See 2013 and 2014 recaps here. Here is a photo of me at my talk from the 2014 conference (photo by Justin Hackworth). To make it even sweeter it has been moved to the fabulous Palm Springs - just 2 hours away! No more snow. It is usually in Utah and in January it is BRICK COLD. Last year I gave a inspiration shopping tour (we braved the cold but luckily one of the attendees had a large vehicle and drove us around). I am looking forward to warmer weather, driving there with my bud, Andrea, (it's a fun ride) and most importantly - staying at the popular Saguro hotel! Isn't it just the quintessential Palm Springs hotel? It is quite the perfect location for this shin-dig too. Us crafters, photographers and designers who blog are going to be bug-eyed with all the eye candy and inspiration here. There are several breakout sessions and activities at the conference you can attend. One of the sessions are roundtable discussions held in the ballroom. Each table has a different topic of discussion led by someone (like me!) who is there to help educate and hold collaborative conversations about topics that pertain to the attendees like topics for professional bloggers, running a creative business, writing a book, organizational tips, personal development and many more. I will be leading a discussion on a topic I'm passionate about, "How to Tap Into Your Authentic Creative Self and Overcome Creative Blocks". I'm in the process of writing my presentation and looking forward to meeting others who want to dive into uncovering their true selves. I am sure we will have some great convos! If you are there I'd love to meet you. If not I'll be sure to recap it all here in February! 2016 is was an EYE OPENER for me! As I sat on the plane coming home from holiday vacation I saw this amazing skyline. It felt like the right moment to reflect on the year passed and think about my lessons learned - lessons I can use going into 2017 and think are helpful for everyone. I can't wait to see what the new year holds and am joyfully optimistic that it will be filled with magic. 1. Be More Patient & Let Go I get really anxious and impatient about something that I want to happen and I obsess, it doesn't work out and I dwell. I am sure this is pretty common but I learned to let go more and more and release my control. It is easier said than done but it has helped me tremendously. I realized I can't control the situation but I can control how I react. For me it's about not wasting energy and avoiding any unnecessary anguish. Another thing I do is I always want to know WHY something happened. I do spend a little time trying to find the lesson in it and when I do it is healing. I may figure out why it was caused in the first place (usually to create a better outcome that I may not have noticed) or what it is teaching me. But I usually abandon it after awhile if I can't see why since it isn't worth the energy and I need to move on. Just let things go and don't sweat it. 2. Be More Flexible I can highly recommend going with the flow. Letting things play out, easing up your impatience and being flexible THROUGHOUT it ALL - especially when it doesn't work out - can really save you a lot of suffering or frustration. If things swing one way now I just go with it and lean into that direction. Resistance will make things go sideways. Pushing against something will just make it worse and not help the situation. Go with the flow! 3. Be Gentler to Myself Being more gentle with yourself can work wonders too. We are all hard on ourselves and it just causes us to spiral down more and more. I spend a lot less time making myself feel bad now. It hasn't helped me move forward and keeps me from focusing on the positive. It messes with your confidence and self esteem too. Why would you want to stay in a mental prison? Again it is about not spending our energy in the wrong places - I'd much rather spend it being happy, optimistic and looking to the future than beating myself up all day over something that was in the past. Go easy on yourself and let yourself off the hook! I am hopeful for 2017 and plan on being more easy-going, optimistic and enjoying life more. Hope that the new year is expansive, joyful and your best year yet! I feel so lucky to be able to teach what I love and share my passion for design. Monday nights this fall I taught "Introduction to Surface Design" at Art Center in Pasadena. It is a part of their "Art Center at Night" program (which is their continuing education program). I have taught there previously in the summer exchange program and really enjoy teaching there. I especially loved this class as the students were very engaged and extremely creative. They had varied artistic backgrounds with very different point of views like a former motion graphics designer with serious watercolor skills to a greeting card designer who draws whimsical illustrations to a gallery assistant with a refined fine art background. They all enrolled to learn more about how to be a surface designer, how to develop a collection, put together a presentation and initiate their design portfolio in their art style. Everyone embraced the lessons and homework and turned in well-thought-out, conceptual work. They did an amazing job and made this girl proud - Boom! I rounded the class up and had a field trip to Old Town Pasadena's shopping district to inspiration shop. We cruised the boutiques and major retailers to identify current trends, see products that inspire them and their work, locate surface designer's work and find products that license art. We all agreed it was so refreshing to get out of the classroom, hang out together and see design in the wild. Everyone saw items that they cheerfully identified with and inspired them. It was a fun day. Here are a couple photos I took of items that inspired me. The students continued to make several inspiring collections in our 13 weeks together. I loved seeing their progress and getting their feedback per assignment. It was interesting to hear from each student that they had no idea how difficult it was to make a collection. I agree that it isn't easy at first but you definitely get the hang of it and get hooked! They each had their own challenges but with each project got more and more comfortable. For every project I encouraged them to work in their style whether it was by hand or digital and to reach out to me if they needed assistance. By the end they were all critiquing their earlier designs, revising their work and turning in stunning collections. The first week of class I educated the students about the world of surface design and had them write 1-pagers on two designers they researched. They discovered designers such as Rebecca Atwood and Mindinara and each presented their findings to the class. 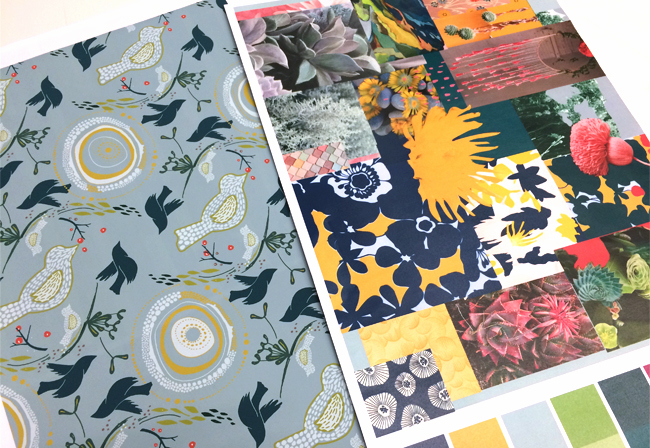 They said it helped them to really understand the profession of surface design and I was so glad to hear that - it's exactly what I was hoping and it helped to get their engines going. After the research project, we dove into the anatomy of a collection, how to make repeats in Illustrator, how to make moodboards, pick a color palette and start a collection. For their final project I gave them complete free rein where they were able to design a collection in the theme of their choice. They showed me they were now pros and finished strong. Here are some highlights from our final critique. You can see it in action too! Watch a segment of the critique on my Periscope here! Isn't this so imaginative? Any ninja-loving little one would go bananas over this. The mock-ups of the bedding, the paintings and the limited color palette blew me away.How adorable and conceptual are these illustrations? I can see this developed across several product categories. My student, Winter, challenged herself using 3 colors to make this holiday collection. We knew it was creatively ambitious and boy did she deliver! It came out really lovely. Look at this darling collection! I love her hand-drawn, whimsical designs. What an elegant holiday pattern in these unconventional but gorgeous colors. Her watercolor technique slays! 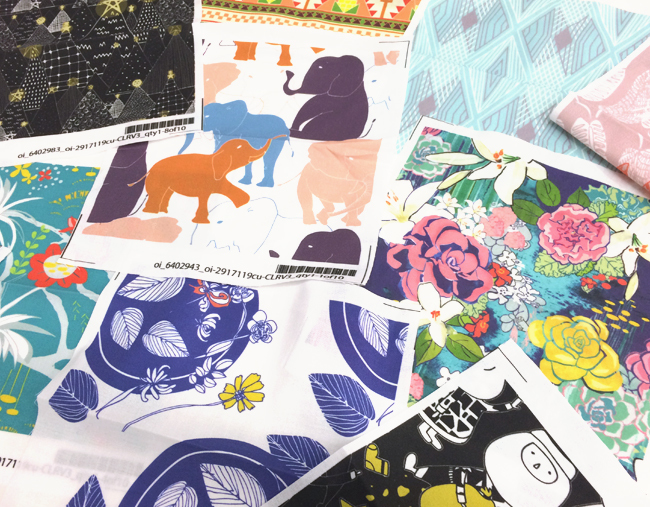 Spoonflower provided the class with a scholarship that paid for free fabric swatches. They students were so excited to make fabric from their designs! I was too! Seeing the students' progress, their faces light up when they started to understand things and really get excited about their work was so gratifying to me. 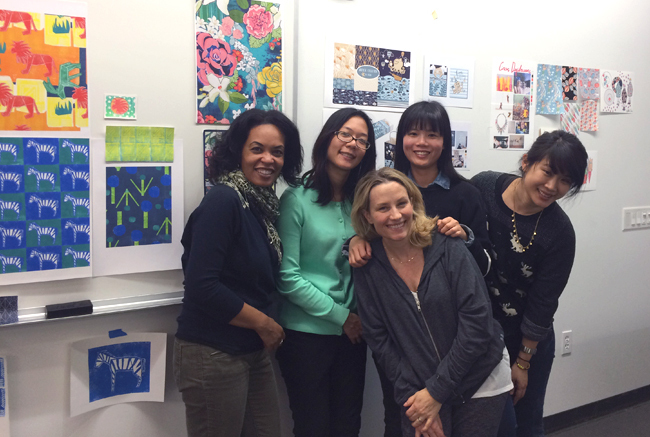 I urged them to keep designing and will really miss this talented bunch (we are missing Paige in the photo - Hi Paige! ).